Nope, didn't get hit by a bus. Didn't get arrested and thrown in jail. Didn't chuck all of my rods into the dumpster and take up golf. Nothing like that. The reason I haven't been posting much is, well, guess I've just been lazy. Ok? Been doing a fair amount of fishing lately, mostly for bass and striper. The largemouth and spot fishing has been pretty good, although it did slow down as August heated up. Still, a pretty decent summer for bass. The striper fishing was spotty at best, but I did learn quite a bit about one particular striper river near me. I figure that will pay off next year when these dudes move back up in there. So, it has been several months of slinging big old honkin' streamers with 7 and 9 weights, and frankly I'm ready to put those big sticks down for a while. I'm anxious to get know my 3 and 4 weight rods again. They've been looking kind of lonesome sitting in the rod rack for these past few weeks. 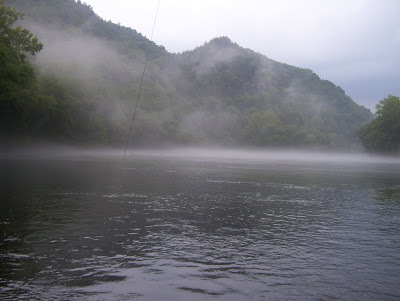 And that's how I ended up on the Hiwassee river this past weekend. Not a bad way to get back into the trout groove again. She's had a few rough years, what, with the drought and all, but the Hi is still a great piece of water. Given the rain we've had this year, hopefully the river make a comeback and become the blue ribbon fishery she's been in the past. Water temps were around 65 degrees today which isn't bad for this time of year on that river, and the fish were healthy and in good shape. Good signs for the Hiwassee in late summer. Fished with a friend from work who has been wanting to learn more about fishing around here. He's from out west and isn't all that familiar with the waters in the Southeast. So he said that if I showed him around, he would reciprocate and take me on some of his fishing trips out west. Seems like a fair trade. We fished from around 5pm to 8:45pm. Spent most of our time around the Gauging Station and caught a few each. Shawn actually nailed a nice 'bow on his first cast. Cool. I caught all of mine on a PT dropped off of an olive woolly bugger. Most took the PT, but a couple did eat the WB. Shawn dropped a prince nymph from a hopper. He caught most on the nymph, but a few did take the dry which was nice. Moved up to the powerhouse to fish the last hour before dark. Shawn picked up a few more fish, as did I. I actually started throwing a white woolly bugger to see if I could catch a big brown moving out of his lair for some nocturnal feeding. No dice, but did pick a few more small 'bows. All in all, a very pleasant trip. We got hammered with some pretty good rain showers off and on while we were there, but that didn't really matter. Spent a few hours on a beautiful river, nailed a few fish, and generally had a great time. Looking forward now to some wintertime tailwater trouting.